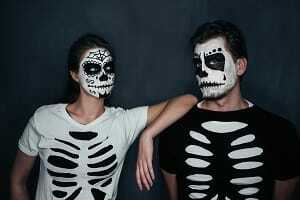 With the many Halloween festivities, people enjoy going above and beyond when putting together their costume. What they don’t know is that many costume accessories such as decorative contact lenses and store-bought make up, can lead to eye irritation or injuries. Halloween is just around the corner! Keep your eyes safe by following these eye care tips to avoid any injuries. Everyone knows that sharp objects need to be handled with care. Swords, knives and other pointed costume accessories can easily lead to eye injuries. Opt for safety and choose props that are rounded, flexible and soft when accessorizing. Every year people get injured from wearing decorative contact lenses on Halloween. Because they haven’t been prescribed by an ophthalmologist, these lenses can be damaged, expired or made with unsafe dyes. Using decoration contacts can cause conditions such as irritation, abrasions, blurred vision, fungal infections, or worse, lead to permanent vision loss. If your mind is set on wearing colored contact lenses, call your ophthalmologist and get prescribed contacts that are safe and fit properly. Some costumes require elaborate makeup or paint to complete the look. However, some makeups and paints can cause serious harm to the eyes. It is important to always ensure the makeup you choose is hypoallergenic, not expired and contains coloring approved by the FDA. Furthermore, avoid applying it near your eyes and always remove it completely before going to sleep. Halloween costumes don’t have to lead to eye injuries. For more information about eye care safety, call 602-242-6888 or visit our website to schedule an appointment with one of our eye care specialists.